From November 5 to 10, 2017, Miami Dade County received the largest international delegation ever hosted in the county. 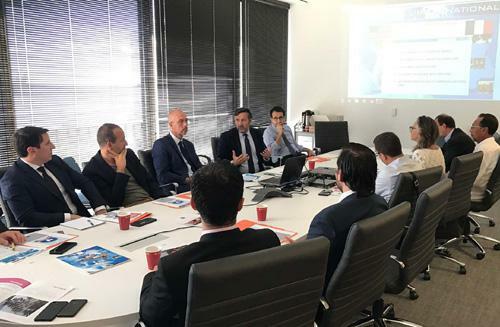 117 representatives of institutions and companies of Aix-Marseille-Provence Metropolis visited with two objectives: to promote the economic and touristic attractiveness of the French territory and to develop their businesses in South Florida. Technical meetings and "B to B"
Led by Jean-Claude Gaudin, Mayor of Marseille and President of the Aix-Marseille-Provence Metropolis, and Martine Vassal, President of the Bouches-du-Rhône County Council, a large delegation traveled to Miami to promote the destination of Marseille and the Bouches-du-Rhône department, as well as its sectors of excellence: health, the cruise industry, tourism and lifestyle, the digital sector and the aeronautical industry. 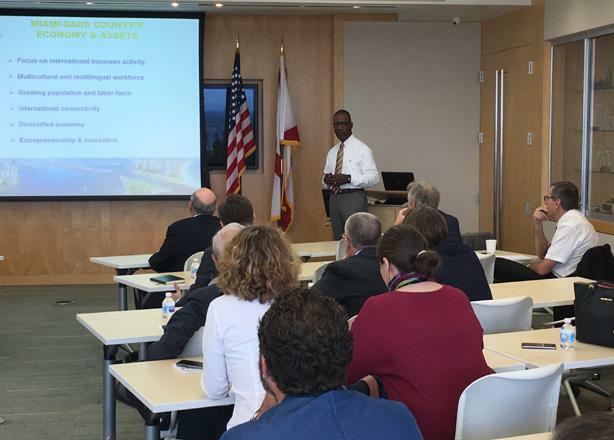 For 5 days, 117 institutional representatives and entrepreneurs from Marseille and Provence met with elected officials and local entrepreneurs in South Florida. 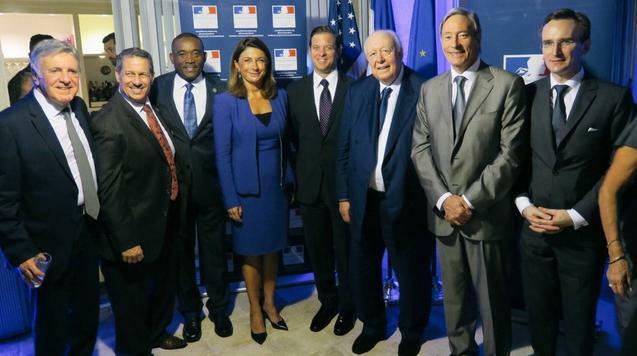 From left to right: Jean Roatta, Deputy mayor responsible of the euro-mediterranean cooperation, Jose "Pepe" Diaz, Commissioner, Jean Monestime, Commissioner , Martine Vassal, President of the Bouches du Rhône Departmental Council, Carlos López-Cantera, Lieutenant Governor of Florida, Jean-Claude Gaudin, Mayor of Marseille and President of the Aix-Marseille-Provence Metropolis, Bernard Deflesselles, Deputy, and Clément Leclerc, Consul General de France. 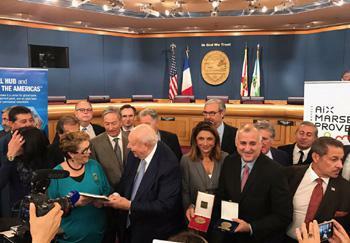 This visit, which allowed French companies from the Aix-Marseille-Provence Metropolis to meet local officials and entrepreneurs, resulted in the joining of the metropolis and the Miami-Dade County through a sister city agreement. This union, the first cooperation agreement between Marseille and an American city, aims to build a partnership based on economic programs and tourism promoting the two areas. 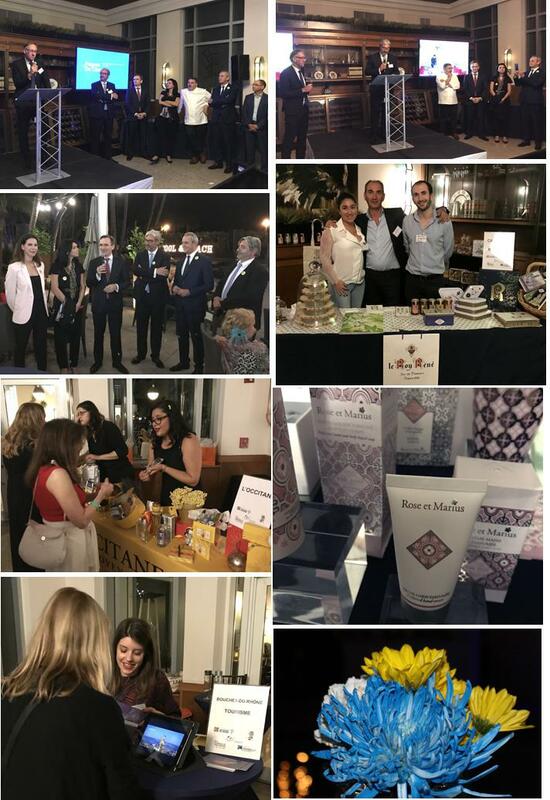 The promotion of Provence’s region and the development of tourism and cultural partnerships between Miami and the Metropolis of Aix-Marseille-Provence were two of the main objectives of the visit. The Provencal cities and the Bouches du Rhône Department attract more than 9 million tourists each year. A true economic powerhouse, the tourism sector both directly and indirectly produces approximately 50,000 jobs in the French region. 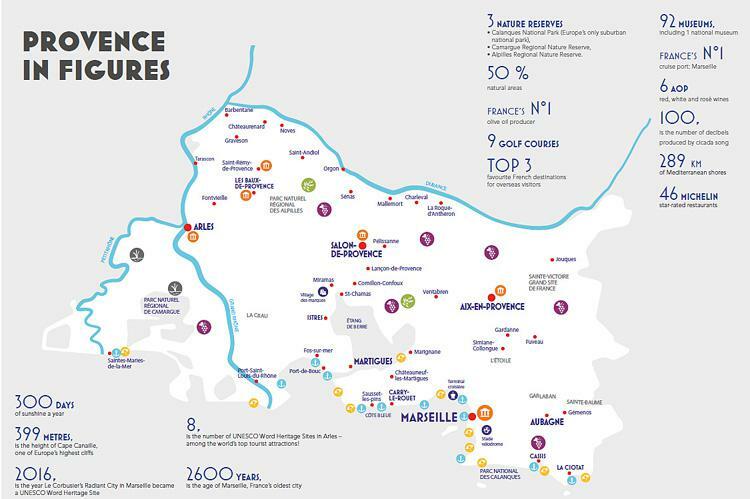 With 300 days of sunshine a year, leading museums and festivals, cruise ports that attract a growing number of passengers, internationally recognized nature parks such as Les Calanques, and an unparalleled quality of life, Aix-Marseille- Provence which is not lacking of advantages intends to promote them. Florida and Miami have been championing the tourism sector for a long time and continue to attract more international visitors every year. For this reason, the French delegation met and exchanged with many industry players and representatives of the leading promotional agency "Visit Florida". The agency, whose mission is to attract tourists and professionals in the Florida peninsula presented its promotional actions to the members of the delegation, actions from which they can largely draw inspiration. Marseille and Miami that are key players in the cruise industry and have a lot in common intend to learn greatly from each other and establish new bonds. Many meetings were also held with cruise lines including Carnival Cruise Line, Silversea Cruises, Royal Caribbean Cruise Line, Disney Cruise Line and the Cruise Club of Marseille to discuss the development of new voyages between the ports of Miami and Marseille. On November 7th, the SMARTPORT conference, which took place in the presence of the Marseille Fos, Euroméditérrannée and Miami ports authorities, focused on the optimisation of port infrastructures. (Presentation available below). In order to entice the tour operators of Florida, key players involved in the choice of tourism and professional destinations for conferences and business shows, to turn their gaze towards France, two workshops and two soirees were held on behalf of Marseille and Provence. At these events, attendees were able to discover or rediscover the attractions of the Mediterranean city and its region. The first promotional event highlighting the city of Marseille brought together more than 150 investors, business leaders, elected representatives and members of economic and tourism organizations on November 7, 2017 at the Perez Art Museum. During the event, different personalities who, thanks to their actions, are true ambassadors of Marseille were awarded. Franck McCourt Jr., owner of the Olympique de Marseille, David Candib, Vice-President of Carnival Corporation, Federico Gonzalez of Royal Caribbean Cruise Limited, and Bruno Gutton, Vice-President de CMA-CGM were among these distinguished guests. (photo of the delegation gathered at the Perez Art Museum below). The second event organized with the support of Atout France, attended by more than 70 tour operators and several local journalists, put Provence in the spotlight. 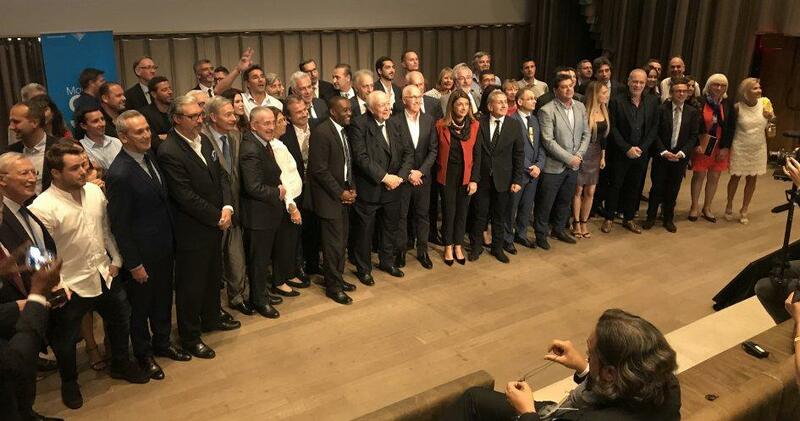 Officials, participants et exhibitors of the Bouches du Rhône Department during the promotion event "Provence in Miami"
As a result of the collaboration that took place during these meetings, the famous castle of La Buzine in Marseille now has an agreement with the Miami cinema. This agreement promises cinematographic exchanges between the two institutions and an agreement with the Pérez Art Museum. 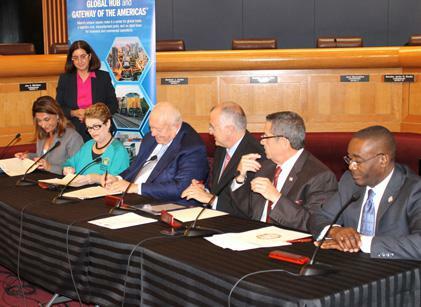 Similarly, the Marseille Convention and Tourism Office in partnership with the “World Trade Center” of Marseille, signed a "gentleman agreement" with the Greater Miami Convention and Visitors Bureau. Among the projects selected, there is the creation of an Arts district dedicated to street art directly inspired by Wynwood. As is already coming to fruition, the sister city agreement between the Metropolis of Aix-Marseille-Provence and the County of Miami-Dade on November 6, 2017 will facilitate the establishment of economic, tourist and cultural bridges of this type between the two territories. Among the members of the delegation, there were also eminent professors who came to participate in the conference on genetics: Professor Nicolas Lévy, Head of the Department of Medical Genetics (APHM), Director of the joint unit GMGF (Medical Genetics and Functional Genomics) of INSERM (Medical research Institute in France) and of the Faculty of Medicine at the University of Aix-Marseille, and President of GIPTIS, Professor Didier Blaise, Institute Paoli-Calmettes of Marseille, and Professor Frédéric Collart, Head of the Cardiac Surgery Dept of the Hospital La Timone. During this visit, Professor Didier Blaise was able to meet with medical professionals from his same field of study at the Miami Cancer Institute Baptist Health South Florida on November 8, 2017 with Ms. Caly-Sanchez, Director at the Jean Monnet European Union Center of Excellence at the International University of Florida. 42 companies in the city representing the sectors of excellence of the territory including health, ports, tourism and lifestyle, digital, catering, culture and aeronautics participated in this mission of autumn 2017. 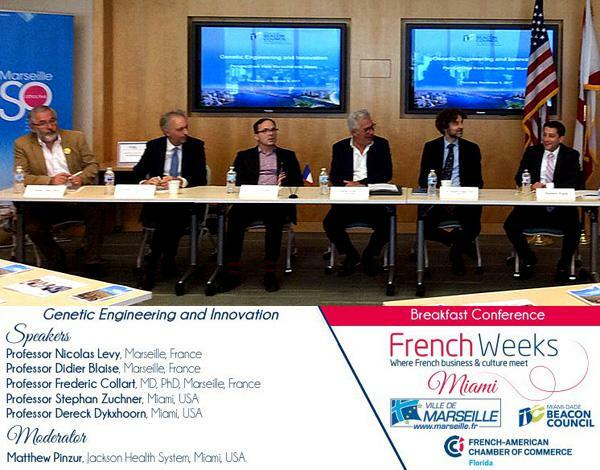 Thus, 200 "B to B" meetings were organized by the French-American Chamber of Commerce of Miami (FACC) as part of the 10th annual "French Weeks Miami" event, Business France, Atout France and the development agency Euroméditérranée. 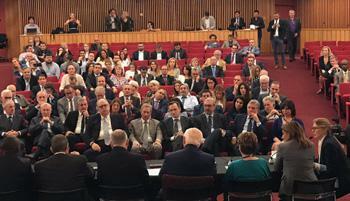 Presentation of the projects of Miami by the Beacon Council - Nov.6, 2017. In addition to "Visit Florida", entrepreneurs and representatives of regional development agencies present, such as the Chamber of Commerce and Industry of Marseille Provence (CCIMP), the economic development agency "Provence Promotion", and the Grand Port Maritime Marseille (GMPP) had the opportunity to interact with "Space Florida" (Florida’s Space Agency), the Florida High-Tech Corridor, the Beacon Council, (Miami Dade County Economic Development Agency), the Miami Downtown Development Authority, and Enterprise Florida, (the state’s economic development agency). : Approximately twenty entrepreneurs took advantage of their time in Miami by meeting with two members of French Customs who are key partners in international exchanges: Mr. Jean Noël Blanc, Customs Attaché at the Embassy in Washington and Mr. Rodolphe Gautreau, Deputy Customs Attaché at the Consulate general of France in Miami. At this time, entrepreneurs had the opportunity to discuss export arrangements with the United States. 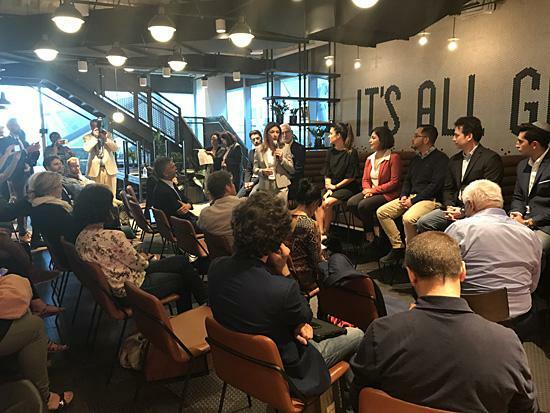 French companies operating in the digital sector were at the meeting "French Tech", which took place at the accelerator WEWORK in Miami. Martine Vassal, President of the Bouches du Rhône departmental Council, welcoming the participants. 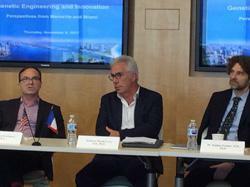 A roundtable discussion on digital security also took place in the framework of French Weeks Miami 2017. In order to share valuable practices and the latest techniques used in emergency situations, several members of the delegation of the metropolis also visited the Miami Dade County Crisis Management Center.